In discussions of funding for public education, an important point is often overlooked: the sheer number of school districts within Oklahoma and the administrative costs that accompany them. Caddo County—a 1,200 square mile county in southwest Oklahoma—has almost as many school districts as the entire state of Nevada. Caddo’s eleven school districts serve a total of 5,901 students, an average of 536 students per district. 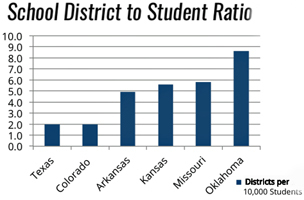 This student-to-district ratio is similar across much of the state of Oklahoma. Oklahoma surpasses Arkansas, Kansas, Missouri, and Colorado for the total number of school districts with 516. Although Texas has more districts (1,025), its average student enrollment per district is four times higher than in Oklahoma. Among all six of these states, Oklahoma has the least students per district (1,344). Although some argue that smaller size results in a higher quality education, comparisons like the Education Rankings published by U.S. News generally show Oklahoma in the middle of the surrounding states with regards to education outcomes—suggesting that fewer students per district is not necessarily resulting in greater academic achievement. The greater number of school districts does, however, come with some higher costs. While states like Colorado and Texas have about one school district per 5,000 students, Oklahoma has more than four. That means four times more superintendents (half of whom are paid at least $100,000 per year) and four times the fixed cost of running a school district. These fixed costs of operating so many districts mean less money in Oklahoma’s education budget to increase teacher pay or purchase new textbooks. The abundance of school districts could also explain some of the growth of non-teaching jobs in Oklahoma public education. Between 1998 and 2011, Oklahoma increased school administration employees by 49 percent, while student enrollment only increased by 6 percent. In other words, in the Oklahoma education system, administration grew eight times faster than the students did. When federal or state overreach imposes burdens on local districts, those burdens can require hiring additional district-level staff. While no one can blame school districts for unfunded mandates, perhaps the cost of such overreach would be less if Oklahoma had fewer public school districts. 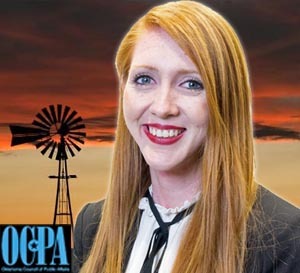 About the author: Hallie Milner currently serves as a communications associate for OCPA. Previously, she has worked as a legislative reporter in the Oklahoma state capitol and on both local and national campaigns. Hallie received a Bachelor of Science in Mass Communications, Public Relations & Advertising from Oklahoma Christian University and a Master of Arts in Political Communication from the University of Oklahoma. This entry was posted in State on August 7, 2017 by admin.